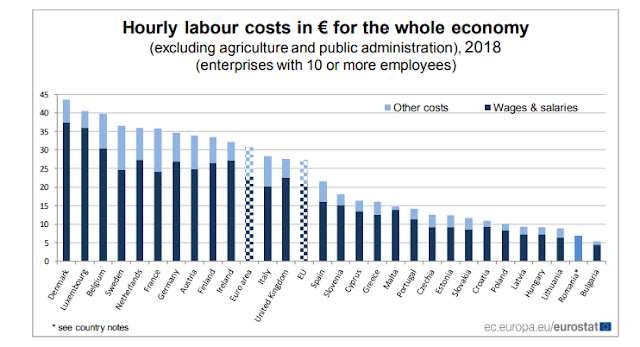 In 2018, average hourly labour costs in the whole economy (excluding agriculture and public administration) were estimated to be €27.4 in the European Union (EU) and €30.6 in the euro area. However, the average masks significant gaps between EU Member States, with the lowest hourly labour costs recorded in Bulgaria (€5.4), Romania (€6.9), Lithuania (€9.0), Hungary (€9.2) and Latvia (€9.3), and the highest in Denmark (€43.5), Luxembourg (€40.6), Belgium (€39.7), Sweden (€36.6), the Netherlands (€35.9) and France (€35.8). Hourly labour costs in industry were €27.4 in the EU and €33.2 in the euro area. In services, they were €27.0 and €29.6, respectively. In construction, hourly labour costs were €25.0 in the EU and €27.6 in the euro area. In the mainly non-business economy (excluding public administration), they were €28.5 and €30.8, respectively. Labour costs consist of wages & salaries and non-wage costs (e.g. employers' social contributions). The share of non-wage costs in total labour costs for the whole economy was 23.7% in the EU and 25.6% in the euro area. It ranged from 6.1% in Malta to 32.6% in France. These estimates are issued by Eurostat, the statistical office of the European Union. Data cover enterprises with 10 or more employees and are based on Labour Cost Survey data for 2016, which are extrapolated through the Labour Cost Index. 0 5 10 15 20 25 30 35 40 45 Hourly labour costs in € for the whole economy (excluding agriculture and public administration), 2018 (enterprises with 10 or more employees) Other costs Wages & salaries * see country notes Hourly labour costs increased most in Romania, least in Malta In 2018, compared with previous year, hourly labour costs in the whole economy expressed in € rose by 2.7% in the EU and by 2.2% in the euro area. Within the euro area, the largest increases were recorded in Latvia (+12.9%), Lithuania (+10.4%), Estonia and Slovakia (both +6.8%). Hourly labour costs increased least in Malta (+0.4%), Finland (+1.2%), Spain (+1.3%) and Portugal (+1.4%). When comparing labour cost estimates over time, levels expressed in national currency should be used to eliminate the influence of exchange rate movements. For Member States outside the euro area in 2018, the largest increases in hourly labour costs in the whole economy, expressed in national currency, were observed in Romania (+13.3%) and Hungary (+9.8%). They increased least in Denmark (+1.9%), Sweden (+2.3%) and the United Kingdom (+3.3%). Geographical information The European Union (EU) includes: Belgium, Bulgaria, Czechia, Denmark, Germany, Estonia, Ireland, Greece, Spain, France, Croatia, Italy, Cyprus, Latvia, Lithuania, Luxembourg, Hungary, Malta, the Netherlands, Austria, Poland, Portugal, Romania, Slovenia, Slovakia, Finland, Sweden and the United Kingdom. The euro area includes: Belgium, Germany, Estonia, Ireland, Greece, Spain, France, Italy, Cyprus, Latvia, Lithuania, Luxembourg, Malta, the Netherlands, Austria, Portugal, Slovenia, Slovakia and Finland. Methods and definitions Total Labour Costs refer to the total expenditure borne by employers in order to employ staff. They cover wage and non-wage costs less subsidies. They do include vocational training costs or other expenditures such as recruitment costs, spending on working clothes, etc. Wage and salary costs include direct remunerations, bonuses, and allowances paid by an employer in cash or in kind to an employee in return for work done, payments to employees saving schemes, payments for days not worked and remunerations in kind such as food, drink, fuel, company cars, etc. Non-wage costs include the employers’ social contributions plus employment taxes regarded as labour costs less subsidies intended to refund part or all of employer’s cost of direct remuneration. The whole economy (except agriculture and public administration) includes NACE Rev. 2 sections B to N and P to S, and can be subdivided into the following economic activities:  The business economy, which includes NACE Rev. 2 sections B to N; for the EU this accounts for about 75% of the total labour costs of the whole economy. It can be further broken down into: - Industry, which includes NACE Rev. 2 sections B to E (Mining and quarrying; Manufacturing; Electricity, gas, steam & air conditioning supply; and Water supply, sewerage, waste management & remediation activities). Industry accounts for around 23% of the whole economy in the EU. - Construction; NACE Rev. 2 section F, which accounts for 5% of the whole economy in the EU. - Services, which include NACE Rev. 2 sections G to N (Wholesale and retail trade, repair of motor vehicles & motorcycles; Transportation & storage; Accommodation & food service activities; Information & communication; Financial & insurance activities; Real estate activities; Professional, scientific & technical activities; Administrative & support service activities). They account for around 47% of the whole economy in the EU.  The mainly non-business economy (excluding public administration), which includes NACE Rev. 2 sections P to S (Education; Human health & social work activities; Arts, entertainment & recreation and Other service activities); for the EU this accounts for about 25% of the labour costs of the whole economy. Labour costs data presented in this News Release cover enterprises with 10 or more employees. Apprentices are included. Labour cost data for the years 2008, 2012 and 2016 come from the Labour Cost Survey. Estimates for years after 2016 are obtained by extrapolating the 2016 Labour Cost Survey hourly labour cost data expressed in national currencies using the Labour Cost Index (LCI) transmitted by the Member States. In order to calculate monetary estimates in € and derive European aggregates, average annual exchange rates have been used. The LCI not adjusted for calendar effects is used, except for Denmark, France and Sweden where only calendar-adjusted data are available. Country notes: France: the aggregate shown for the whole economy for 2008 also excludes NACE Rev. 2 section P (Education). Italy: data up to 2012 are not strictly comparable over time due to methodological breaks. Romania: only the total hourly labour cost is displayed. The wage and salary /non-wage breakdown is not published for 2018 as estimates are not comparable with previous years due to changes in national legislation. Data for Austria, Denmark, Spain and Iceland are taken from national sources.